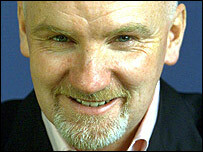 Sir Tom Hunter, Scotland's richest man, is pledging to give away at least £1bn to charity, the BBC has learned. The donation is thought to be the single most generous philanthropic commitment made by a Briton. The ex-owner of sports chain Sports Division has a £1.05bn fortune. He says it will take years to transfer the cash but that he is committed to doing it. He had already committed £100m to his charitable foundation to fight inequality in both Scotland and Africa. In an exclusive interview with the BBC's business editor Robert Peston, Sir Tom said he was concerned about the growing gap in the UK between the rich and poor and wanted to boost opportunities for those at the bottom. He added that putting the fruits of his labour to philanthropic use helped to motivate him as a wealth-creating businessman. He said: "There is more great wealth in fewer hands than ever before in history. "My own personal belief is that with great wealth comes great responsibility. "We've got all the material, goals have all been settled some time ago. So now the philanthropy is the real motivator to continue to make money." He joked: "First of all, I'm a Scotsman, so I'm not very good at giving money away." In April Sir Tom became Scotland's first home-grown billionaire. Ranking 60th equal in the UK, the tycoon has amassed a fortune of about £1.05bn. He grew up in the mining village of New Cumnock in Ayrshire, before attending the University of Strathclyde. He began his career by selling trainers from the back of a van and in 1984 founded the Sports Division chain. The company was sold to retailer JJB Sports in 1998, making Sir Tom an estimated £250m.